On Nov. 25, HoMA and its Museum Shop (along with more than 700 museum stores across the nation) will celebrate Museum Store Sunday—a global shopping event devised by the Museum Store Association to go in tandem with Black Friday and Cyber Monday, for the second time ever. For you, this means that stopping by the Honolulu Museum of Art Shops, at the main location on Beretania Street and at Spalding House in Makiki Heights, on Nov. 25 gets you 10 percent off your purchase. It really does pay off to be a member here at HoMA as members get an additional 10 percent off at the register the week of Nov. 23 to 30. But remember, this day (and week for members) is more than just generating sales and making a profit. 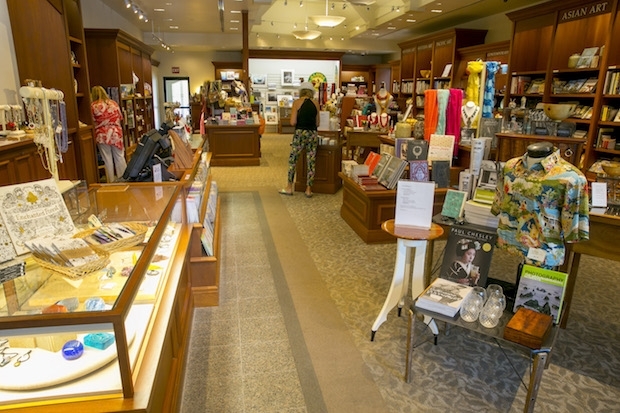 Museum Store Sunday aims to bring awareness to the important role that museum shops have in helping to fund their respective institutions, which translates into educational tours, future exhibitions and more. Spending money in a museum shop means you’re supporting the museum and its mission—and picking up a thoughtful, hand-crafted gift. “This initiative gives people a chance to support local businesses, give back to the community through local nonprofit museums, support good causes, find unique holiday gifts, and enjoy an entertaining and educational experience at favorite museums, all at the same time,” Ione Saroyan, President of the MSA Board of Directors and Director of Merchandise Operations at the New-York Historical Society Museum and Library said. That being said, doesn’t spending the day after Thanksgiving wandering through HoMA rather than braving the over-crowded stores sound much more relaxing? Win-win.